Richard Manning, Jr. (Hawthorne's maternal grandfather; 1755-1813) Hawthorne's maternal grandfather, Richard Manning, Jr. (1755-1813), was born in Ipswich, MA and moved to Salem before 1774. A blacksmith, he became the owner of the Salem and Boston Stagecoach Line, and he acquired considerable property in Maine. Manning prospered; according to Edwin Haviland Miller, at Manning's death he "left an estate of more than $50,000, with real estate holdings worth about $33,000. Mrs. Hathorne did not inherit until 1826 and remained even then a charge of her brothers since she received less than $200 annually" (28-29). Despite his business success, however, Manning and his family lived modestly in the house at 10 ½ Herbert St. in Salem. Richard Manning married Miriam Lord (1748-1826), also from Ipswich, and they had nine children, five sons (William: 1778-1864, Richard: 1782-1830, Robert: 1784-1842, John: 1788-?, and Samuel: 1791-1833) and four daughters (Elizabeth: 1780-1849, Mary: 1777-1841, Maria Miriam: 1786-1814, and Priscilla: 1790-1873). The first child, Mary, was born in Salem in 1777. After her mother died, Mary inherited the Manning house on Herbert St. where she lived until her death in 1841. The second child, William, born in 1778, worked as stage agent of the Salem and Boston Stage Company. It was here where Hawthorne worked as a bookkeeper when he was sixteen. All of Richard Manning's sons except John worked in the family stagecoach business, but it was Robert Manning who managed the business and who enjoyed the greatest success. Miriam Lord Manning (Hawthorne's maternal grandmother; 1748-1826) Miriam Lord was the twelfth child of Thomas Lord and Elizabeth Clarke Lord, a woman who, Margaret Moore reports in The Salem World of Nathaniel Hawthorne, "was accustomed to living thriftily. She is characterized as parsimonious, self-righteous, and with a passion for cleanliness. Nathaniel wrote to his mother in 1819 that his grandmother did not allow fruit or jelly in the house to be eaten 'for it's esteemed sacrilege...because she is keeping them against somebody is sick' even if the fruit spoiled in the meantime" (CE 15:112). She was also, according to Mrs. Moore, a woman with "a very strong sense of family.... Miriam Manning took in her husband's sister when she was old and widowed. She also gave employment (but probably with little or no wages) to her cousin Hannah Lord. From the evidence I have seen, I do not view her as tight-fisted as does Gloria Erlich or, for that matter, as did her Hathorne grandchildren. She was left a widow with money to be preserved and invested for her children and her grandchildren, and she seems to have been conscious of that responsibility" (57). Miriam Lord Manning died in December, 1826, after Hawthorne's return from Bowdoin. Elizabeth (Betsey) Clarke Manning (Hawthorne's mother; 1780-1849) Hawthorne's mother, Elizabeth (Betsey) Clarke Manning, was born in 1780, the second daughter of Richard and Miriam Manning. Richard Manning, Jr. (1755-1813), a blacksmith, was born in Ipswich, MA and moved to Salem before 1774. He prospered as the owner of a stage business in Salem, and he acquired considerable property in Maine. Richard Manning married Miriam Lord (1748-1826), also from Ipswich, and they had nine children, five sons and four daughters. The first child, Mary, was born in Salem in 1777. After her mother died, Mary inherited the Manning house at 10 ½ Herbert St. where she lived until her death in 1841. The second child, William, born in 1778, worked as stage agent of the Salem and Boston Stage Company. It was here where Hawthorne worked as a bookkeeper when he was sixteen. After her family moved to Salem, Elizabeth (Betsey) Clarke Manning attended East Church in Salem, the liberal and Unitarian church presided over by Dr. William Bentley, and she was a participant in Bentley's singing school in 1792. Betsey Manning married Captain Nathaniel Hathorne (1775-1808) on August 2, 1801. Hathorne lived on Union St. in Salem, one street over from Herbert St. where Betsey lived with her family. Her husband went to sea as a youth and was frequently away on long voyages. Their first child, Elizabeth, was born on March 7, 1802, while Hathorne was away on one such voyage. Hathorne was again away at sea when his second child, Nathaniel, was born in the Union Street house on July 4, 1804. The Hathorne's third child, Maria Louisa, was born on January 9, 1808, two weeks after Hathorne set sail on the journey to Surinam (Dutch Guiana) from which he would not return. That spring, after Betsey Manning Hathorne learned that her husband had died at sea, she moved with her children from the house on Union St. to the house on Herbert St. where they lived with her parents and her eight siblings, who ranged in age from seventeen to thirty-one. Thereafter, Betsey Clarke Manning Hathorne was frequently in the position of accepting the favors of her Manning relatives. Her brother, Robert, for example, built houses for her and her children on Dearborn St. in Salem and in Raymond, Maine. Thus Hawthorne's mother was dependent upon the good graces of Manning relatives all of her life. Perhaps this, and the lifelong grief over her husband's death, partly explain the demeanor which, according to Edwin Haviland Miller in Salem Is My Dwelling Place, the Peabodys referred to as "'gloomy or melancholy'" but Betsey Hathorne's daughter, Elizabeth, labelled as merely "'serious'" (32). Although Hawthorne's mother emerges as a parent who was not demonstrative in her affection, the family was close; they supported each other throughout their lives. Elizabeth, for example, helped Hawthorne with his research and checked out books for him from the Salem Athenaeum, and the children were sympathetic to their mother and her plight. Furthermore, this sympathy spills over to Hawthorne's sensitive portrayal of women in his fiction. Although she herself was reared in East Church, it was in the First Church where Betsey Manning Hathorne had her children baptized, and it was a minister of First Church who buried her on August 2, 1849, in the Howard St. Cemetery. Her daughters Louisa and Elizabeth, neither of whom married, are also buried there. 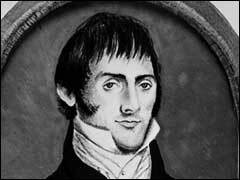 Robert Manning (Hawthorne's uncle; 1784-1842) Of the five Manning sons, it was Robert (1784-1842) who played the greatest role in Hawthorne's life. He arranged for the education of his sister, Betsey's, children, and he was the uncle who was most often present in the Manning home on Herbert St. where Hawthorne lived with his mother and sisters after his father died in 1808. Also, it was Robert Manning who invited Hawthorne to visit him in Raymond, Maine, the village on Lake Sebago where the Mannings had purchased property over the years. (Richard Manning, Robert's brother, moved there to live after he married Susan Dingley from Raymond.) Moreover, in 1818 Robert Manning built a house in Raymond for his sister and her family next door to the house owned by Richard. Hawthorne's days there were spent in the woods and on the lake, and in his later years he fondly recalled these idyllic times. Robert married his cousin, Rebecca Dodge Burnham, in December, 1824, and they moved into a house Manning had built for his bride at 33 Dearborn St. in Salem. Robert Manning operated a stage business and also became a noted pomologist, publishing the Book of Fruits in 1838 with John M. Ives. On land behind this house were Manning's gardens and a fruit orchard. Manning was particularly known for his pear trees; he had over 1,000 varieties in his garden. The house survives, but the orchard and gardens do not. In 1828, Manning built a cottage next door where Betsey Hathorne lived with her children until 1832. That cottage was moved in 1852 across and down the street to number 26 where it stands today. In 1826, while the Hawthornes were living at 26 Dearborn St., Hawthorne's grandmother, Miriam Lord Manning died. Robert and Rebecca Manning had three children: Robert, Jr., Richard, and Rebecca (1834-1933). In The Salem World of Nathaniel Hawthorne, Margaret B. Moore has said that she has found no record of Robert Manning joining a church, but she says that his wife and children joined the Tabernacle Church. Robert, Jr. continued his father's work in pomology. Rebecca Manning never married and lived her entire life in the house at 33 Dearborn St., the last member of the Manning family to live there, and with the exception of her nephew, Richard C. Manning of Gambier, Ohio, was the last surviving member of the Manning family. Richard Manning (Hawthorne's uncle; 1782-1830) After the death of his father, Richard Manning, Jr., in 1813, Richard moved to Raymond, Maine to oversee the family property there. He married a woman from Raymond, Susan Dingley, and remained in Maine throughout his life. Hawthorne visited him there, and he spent happy days in the woods near his uncle's house.